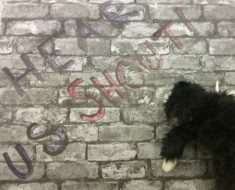 On 22nd February 95 young carers and 45 professionals came together at our annual Young Carers Conference ‘Hear Us Shout!’. 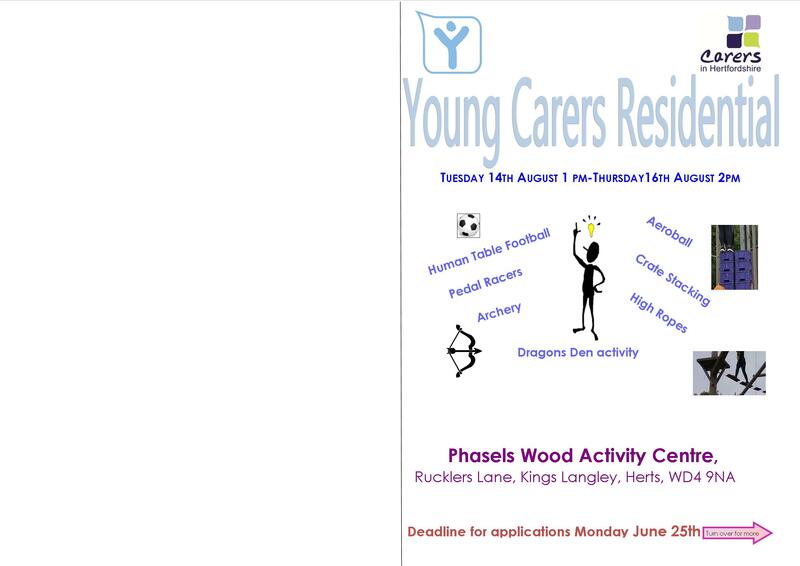 This is an annual event, organised and run by the Young Carers Council. 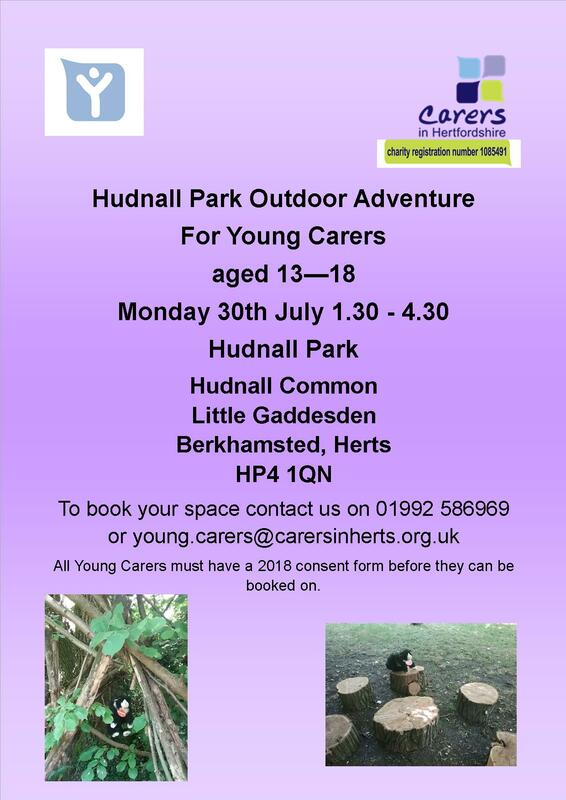 It is a chance for young carers to tell educational, health and social care professionals what it is like being a young carer, and what they need from professionals. 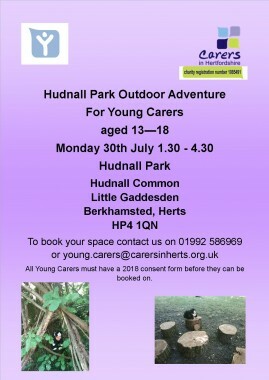 It is also a great way to meet other young carers, and have some fun. In the morning young carers took part in a workshop – crafts & games for Under 8s, ‘All About Me’ art, creative writing, drama, music and creating a human computer game. 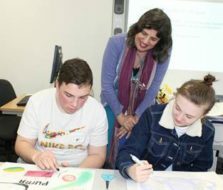 The workshops encouraged young carers to explore and express how caring makes them feel and what they want professionals to know. They were also a lot of fun! They all then created something to ‘share’ with the professionals in the afternoon, including a live simulation of the computer game, short plays demonstrating situations young carers experience, a musical performance using junk percussion, and much much more. The professionals that came were really impressed with the young carers, with lots saying that it was great to hear directly from young carers about what was important to them. 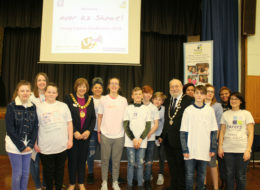 This was our biggest Young Carers Conference yet; thank you so much to the Young Carers Council for all their hard work planning and running the Conference. A big thank you to BBC Children in Need for funding it, and for Oaklands College for hosting. 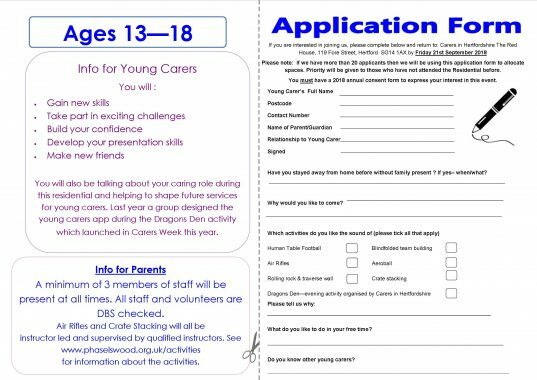 Carers in Hertfordshire are looking to recruit additional Young Carer and adult volunteers for the Young Carers in Schools Ambassadors project. These volunteers will be making a difference in their local schools by speaking up about what it’s like to care whilst being in education and how schools can do more to help. By helping raise awareness of Young Carers, more schools will have the correct knowledge and understanding of how to refer Young Carers in their setting. As an Ambassador you might speak to Teachers/Governors/Staff members about Young Carers and how they can be better identified and supported in school, write letters to local education establishments or help deliver assemblies or attending school events – you will not be asked to do anything you do not feel confident doing and we are also very interested to hear how you feel you might be able to help outside of these roles! 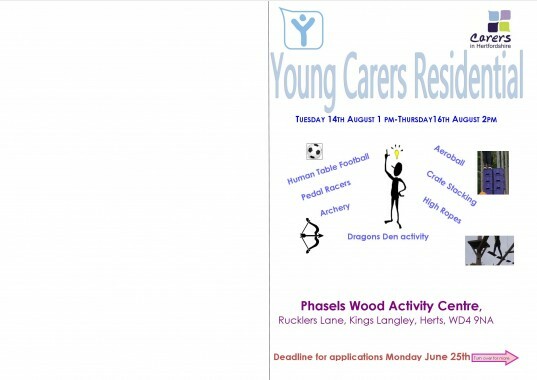 If you would like further information, please contact Amy on 01992 586 969 or email amy.bartlett@carersinherts.org.uk. There will be an opportunity to hear from some of our Schools Ambassadors at our Young Carers Conference on Thursday 21st February – if you are an adult interested in hearing more, please contact us about attending (RSVP is a must). 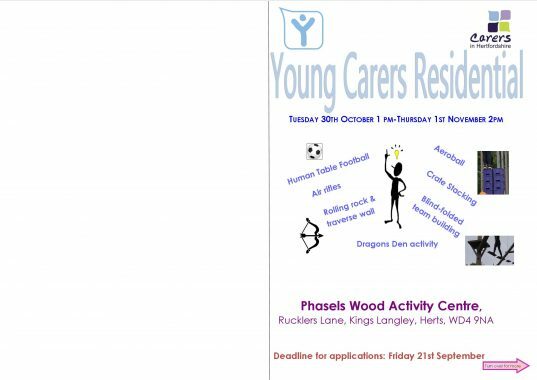 In October half term 18 young carers age 13 – 17 came to our Young Carers Residential at Phasels Wood Scout Camp. 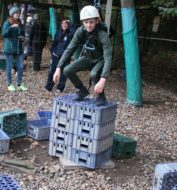 Over 3 days and 2 nights the group took part in lots of different challenges, including: Aeroball, Air Rifle Shooting, Crate Stacking, Human Table Football and a very wet blindfolded team building activity. 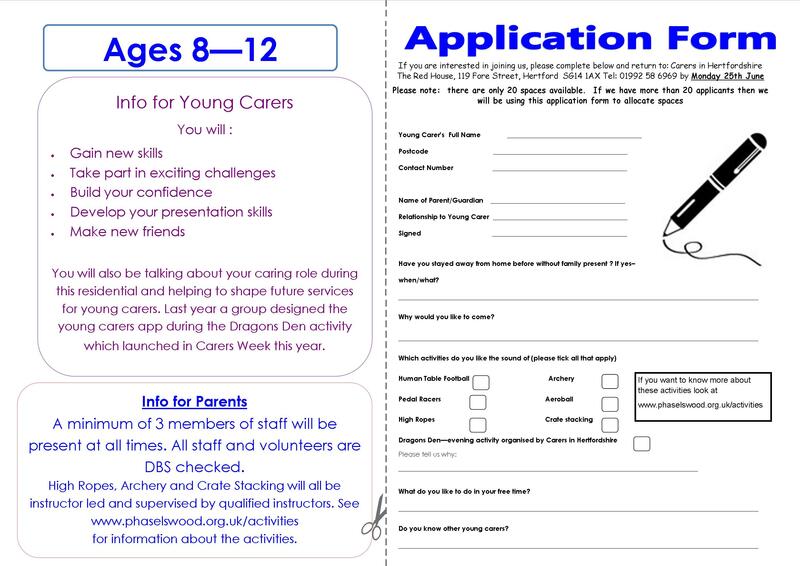 The group also took part in Dragons Den, where they came up with ideas of activities or inventions that would support young carers and pitched these to a panel of Dragons! These ideas ranged from a website with a confidential chatroom for young carers, to a Caring Robot to take on some of responsibilities that young carers have day-to-day. One group even came up with the idea of a Caterpillar Rave – in which young carers could have a party in their sleeping bags! The young carers met with staff from the CCG and gave them some ideas on how health services could be more young-carer friendly. This included things like an updated app, a 24-hour helpline for young carers and better training for GPs, teachers and other professionals. 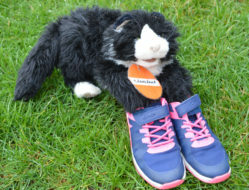 Lolly, aged 14, said “The residential was a great opportunity to get away and meet people like myself. I met a few girls who I am still in contact with now. I had loads of fun and I would go again, 100%”.